A man had been driving all night and by morning was still far from his destination. He decided to stop at the next city he came to, and park somewhere quiet so he could get an hour or two of sleep. As luck would have it, the quiet place he chose happened to be on one of the city's major jogging routes. No sooner had he settled back to snooze when there came a knocking on his window. He looked out and saw a jogger running in place. "Yes?" "Excuse me, sir," the jogger said, "do you have the time?" The man looked at the car clock and answered, "8:15". The jogger said thanks and left. The man settled back again, and was just dozing off when there was another knock on the window and another jogger. "Excuse me, sir, do you have the time?" "8:25!" The jogger said thanks and left. Now the man could see other joggers passing by and he knew it was only a matter of time before another o ne disturbed him. 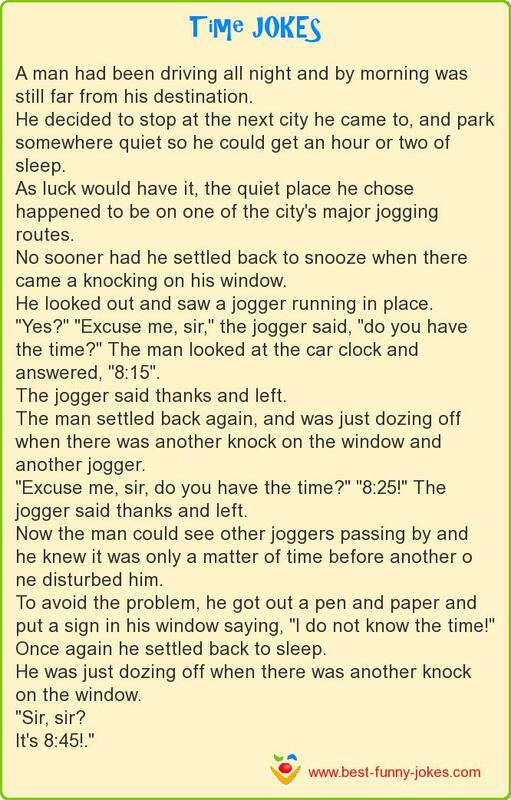 To avoid the problem, he got out a pen and paper and put a sign in his window saying, "I do not know the time!" Once again he settled back to sleep. He was just dozing off when there was another knock on the window.